Advantages: The world best manufacturer of resin replacement parts. What more can I say. Conclusion: Quickboost go out of their way to manufacture resin parts with more accuracy or detail than the equivalent kit part. Quickboost, a part of Aires from the Czech Republic, has gained a reputation over the last few years for producing extremely good resin parts to replace defective or inaccurate kit parts. There are usually only one or two parts in each set and their casting is the best I have ever seen. 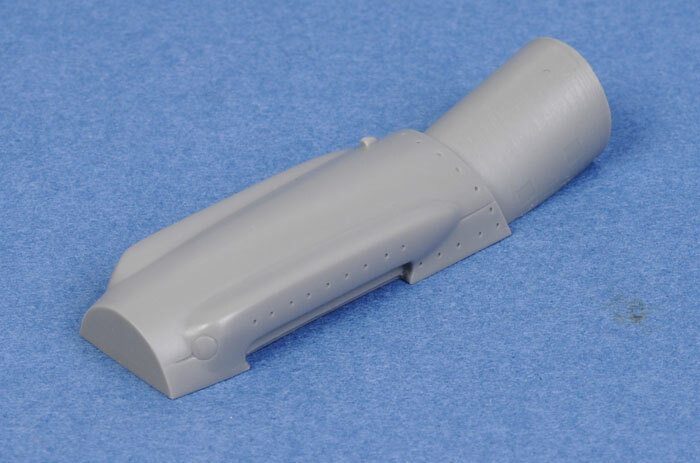 Although I don't have the exact Fujimi kit that these bits are designed for, I have the Fujimi Bubble-Top Mk.XIV which two of the three parts will fit so I have some idea what the difference is. I also have the Academy Mk.XIV which has some similar faults to the Fujimi kit so some of these parts can be used on it also. This is one of the main faults in both the Fujimi and Academy kits. As far as I know, there was no change in the centre fuselage of any of the Spitfire range other than the bubble-top (cut down spine). Therefore, both kits are wrong as they have a very noticeable hump. It should be almost, but not quite straight. This part from Quickboost is a direct replacement but it still, to my eye, looks to have too much curve. 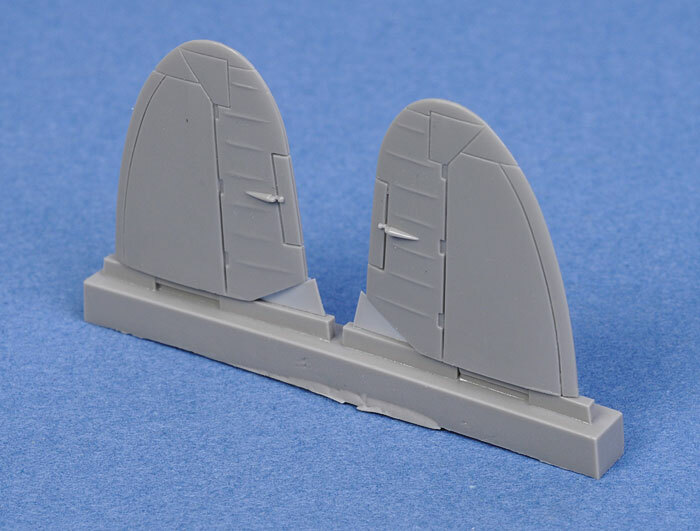 It could also be used on the Academy kit but you will have to cut out the offending section of the fuselage and that could be a bit tedious. Although beautifully cast, I have reservations about how much of an improvement this part will make. 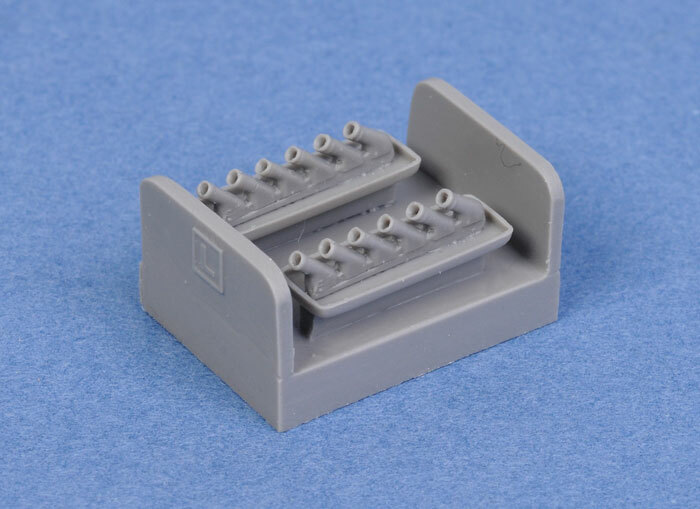 Comparing the Quickboost resin part with that in the Fujimi kit, I can't see a big change in the shape but where as the kit parts are in two halves, the resin bit is one-piece which will make assembly much easier if nothing else. The Academy kit has the cam cover bulges separate so this resin part will be a definite improvement but you will have to remove the Academy engine cover first. 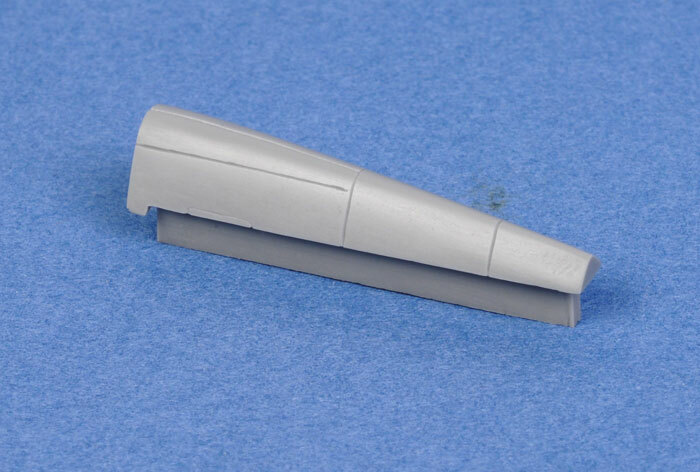 The stabilizers in the Fujimi Mk.XIV are a bit short in length and if you're careful how you cut them off the casting block you will have mounting tongues as well. Thumbs up for this one. (pictured at the top of the page) These are actually designed for the Italeri/Bilek Spitfire Mk.IX but could, I believe, be used for any late model Mk.IX/XVI such as those offered by Hasagawa. You will, of course, have to modify how they are mounted but they are gorgeous, with neat little openings in each pipe and include the backing cover as in the real aircraft. If used correctly, they will be an asset on any Spitfire. I am a little surprised to find that some of these parts don't differ much from the kit parts as Quickboost are usually beyond reproach but perhaps it's just that I've not seen the subtle difference in shape and I don't claim to be a Spitfire Expert so I will leave it up to the modeller to decide. Let me say though, the moulding and detail is superb bar none and these sets are not expensive.